Liberty Bell’s Jadyn Mitchell launched a long-range jumper against Lake Roosevelt. Mitchell led all Lady Lion scorers with 24 points. 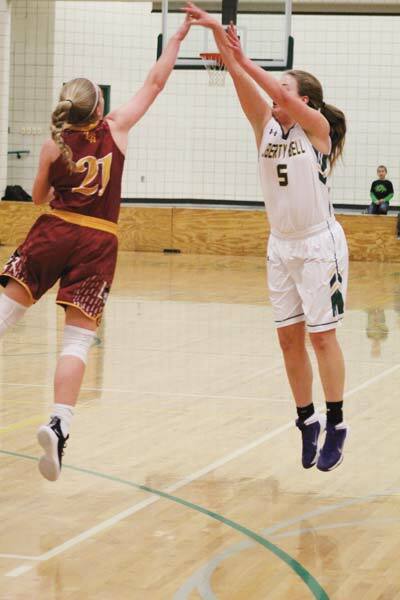 The Liberty Bell High School girls’ basketball team vaulted into third place in league play last week on the strength of its sixth and seventh consecutive wins, over Lake Roosevelt at home and over Oroville on the road. Brewster (8-0, first place) and Waterville-Mansfield (7-1, second place) are the only league teams to beat the Lady Lions this season. In each case, the score was 45-42. Liberty Bell stands at 6-2 in the league and 9-3 overall. The Lady Lions have another shot at Waterville-Mansfield when the second half of league competition begins Friday (Jan. 11) at the Liberty Bell gym. Tip-off is at 6 p.m. In last week’s 57-42 home win, both the Lady Lions and the Raiders played a bit sluggishly in the first quarter, which ended with Liberty Bell up 7-2. The home team extended its margin to 24-15 at halftime. The teams played evenly in the third quarter, but the Lady Lions amped it up in the fourth quarter, scoring 21 points and applying intense defensive pressure. Still, Liberty Bell let a 16-point lead be whittled down to eight before a final push finished off the Raiders. Both teams racked up a lot of fouls, including a technical on one of the Lake Roosevelt players. Liberty Bell coach Stephanie Mitchell, frustrated at some calls late in the fourth quarter, also drew a “T” — which seemed to fire up the Lady Lions, who outscored the Raiders 9-2 from that point to the final buzzer. Liberty Bell’s clamp-down defense included a full-court press. 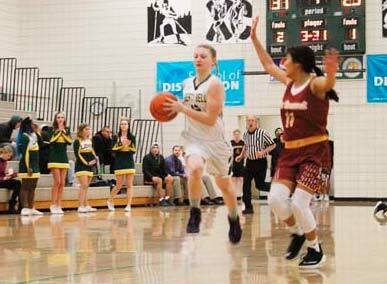 Liberty Bell’s Madison Surface led a fast break against Lake Roosevelt. Freshman Jadyn Mitchell topped all Liberty Bell scorers with 24 points — her best game of the season — and added 11 rebounds for a double-double. She was followed by sophomore Sammy Curtis with 21. Curtis sat out a good portion of the game after two quick fouls in the first quarter. Junior Tommie Ochoa handed out four assists. Junior Ali Palm had six rebounds. At Oroville, the Lady Lions faced the league’s last-place team and weren’t in the mood for an upset, coming away with a 52-37 win. Curtis scored 20 or more points for the third consecutive game to lead all Liberty Bell scorers, and also had seven steals and six rebounds. She was followed by Mitchell with 14 points and Palm with 10 points. Mitchell is leading the Lady Lions in scoring for the season with a 15.3 points-per-game average, while Curtis is averaging 13.8.